Lainey’s vocabulary has been really taking off… along with her happy-go-lucky little spitfire personality. “I’m cooking, Mom! I’m making dinner,” Lainey (our two-year old) informed me, as she gleefully carried dishes from her pretend kitchen into her playhouse, where her little brother waited patiently at the table. “I wanna GO, Mom!” seemed to be the buzz phrase of the morning. I decided to satisfy Lainey’s two year-old wanderlust, by having lunch with Daddy at “homework”. Later on in the day, I had to stop at the bank after dropping her big brother, Devin, off at football practice. Um… tangent. Devin’s first football game is tomorrow. 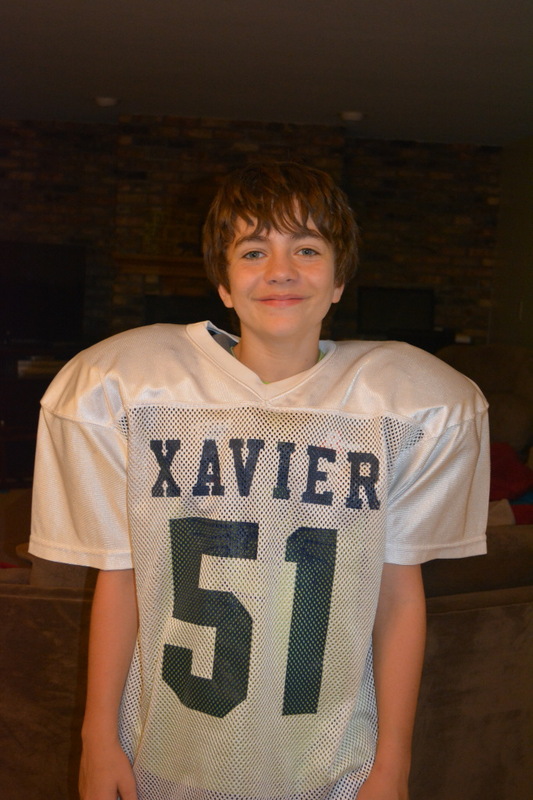 He’s so grown up looking in his jersey… I’m going to cry. I am having a mom “my kids are growing up too fast” moment, and I am going to cry. Awwwww, he looks so handsome. He’s not dating until he’s 35. But back to the bank… we went through the drive up. I was doing my transaction and the bank lady was asking if my kids needed suckers. Lainey chose this moment to roll down her window and belt out, “I’m sooooo fancy!” at the bank teller. If, however, “I’m still in the murder business, I could hold ya down… like I’m giving lessons in physics,” comes out of her mouth, I’ll have to find a new song to play in the car. The bank teller looked at me strangely. I knew what she was thinking… that sweet little girl is singing gangster music. Shame on her mom! “That’s ridiculous!” Lainey screamed out her window. I started to roll Lainey’s window up with my master control, but paused to reach out and grab the deposit slip from the automated drawer. Lainey rolled her window back down. “You’re ridiculous!” She was so thrilled with herself and her antics. “Shut up and drive!” she yelled next. That’s Lainey’s other favorite song (by Rihanna). Oh, I needed to get out of there. Where was the darn button for the child window lock? We drove away. I’m thinking I probably won’t mention Lainey’s gangster rap rendition at the bank teller to her dad. The music got switched to a Christian radio station and she sang along to “Good Morning” all the way home. 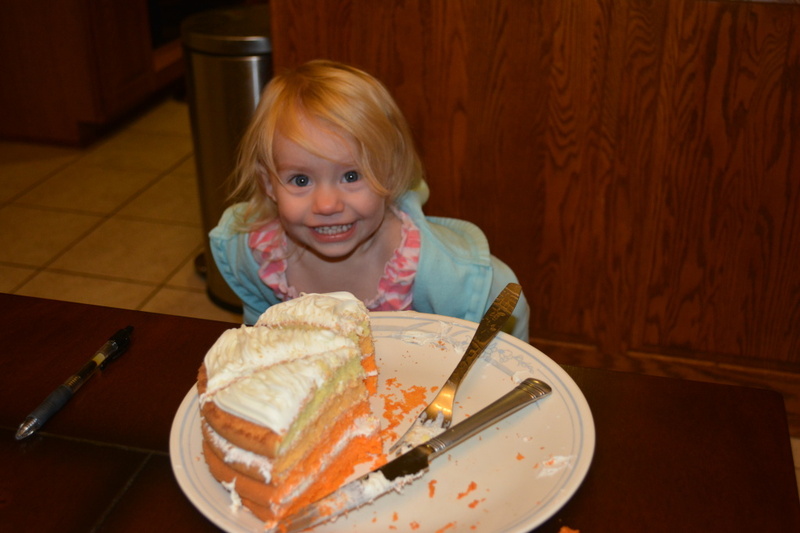 Back at our house, Lainey found a cake and got really happy… until she realized I wasn’t serving it for dinner. Tristan began pulling everything out of the kitchen cabinets. 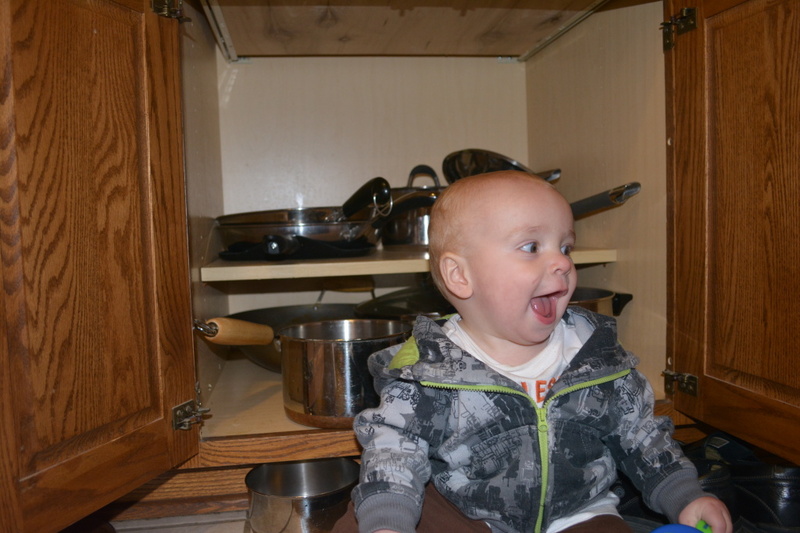 He’s appointed himself organizer of the pots and pans cupboard — and takes his job very seriously. He was taking it seriously until he saw Dad, anyway… then he crawled over to hang on Dad’s pant leg and make gorilla noises until he was lifted into the air. “Dad, that’s ridiculous!” yelled a little voice from the peanut gallery. ‹ I’m From the Congo…?? ?